This classic, fun food has been around for over 5000 years, transforms itself into snowflake and mushroom shapes, goes from un-edible to edible when exposed to heat, makes noise and is celebrated every January 19th! You got it…it’s POPCORN! These lessons and activities will help students recognize and celebrate a popular snack food. 11.3.6 A Demonstrate knowledge of techniques used to evaluate food in various forms (e.g., canned, frozen, dried, irradiated). 11.3.9 G Analyze the application of physical and chemical changes that occur in food during preparation and preservation. Have students complete the Pre Viewing Anticipatory Guide about popcorn nutrition and then view the YouTube clip here. After viewing, complete the Post Viewing Anticipatory Guide. How did we do? 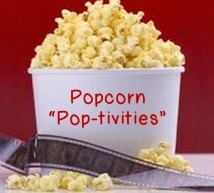 To learn more about popcorn, read the article “Popcorn: A “Pop” History” and complete the questions. (also includes a demo of home made popcorn). See resources below for video information. Are all types of popcorn created equal? Participate in a popcorn lab comparison with three types of popcorn: Microwave, Jiffy Pop and Home made. Focus on preparation time, taste, cost and nutritional value. Use Alton Brown’s Perfect Popcorn Recipe. Using the results from the comparison lab, complete the follow up activities: rankings, graphs, summary paragraph and unit price calculations. Using all of the information students learned about popcorn, have them partner up and create a magazine article titled “20 Things You Didn’t Know About Popcorn” using the “Discover Magazine” template example. This is a great lesson. I've been looking for a lesson to supplement my Consumer Unit. We have been tasting apples for the last several years and the students have loved it. You have put a lot of detail and a variety of resources in this lesson plan. Thank you for your hard work. I was in search of a video guide sheet to go along with the Alton Brown pop corn video and it brought me to your lesson! Thanks for putting this together. I like some of the additional activities you have to go along with it. A huge thank you for sharing your resources (coming from a new teacher)! !